(For Immediate Release - Garden City, Long Island NY - October 30, 2018) This week KastKing, (www.kastking.com) a division of Eposeidon, Inc., introduces a baitcaster fishing reel series named MegaJaws. KastKing MegaJaws shark concept reflects the sense of speed, power and value of the product. 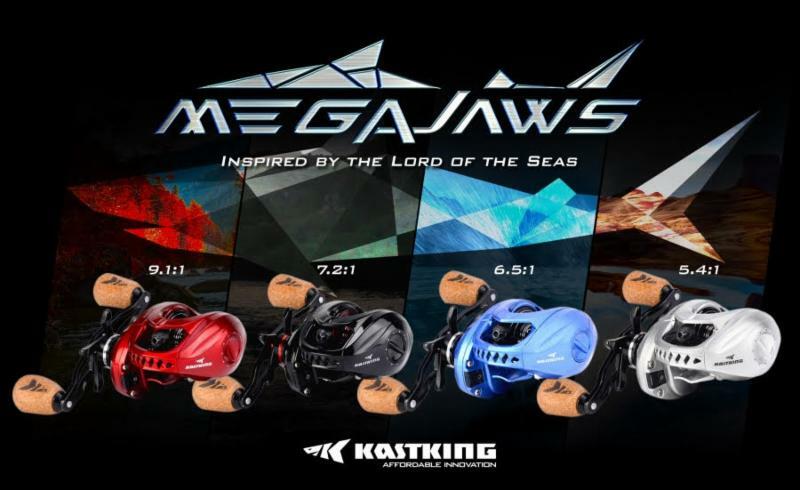 The KastKing MegaJaws baitcasting fishing reel series brings the elements of creative visual design through its shark inspired teeth together with a unique color matched system that has a different color reel representing a specific gear ratio for instant recognition. Anglers can select gear ratios of 5.4:1. 6.5:1, or 7.2:1, and one of the fastest ratios in the market, 9.1:1 9.1:1 that retrieves 33.9 inches per turn. KastKing made product durability and user peace of mind paramount through the use of 11 + 1 double shielded stainless steel ball bearings for saltwater use protection, easy access patent-pending lubrication port and drainage ports making maintenance simple for increased longevity, and its captive tension knob with click detents which retains spool tension settings and prevents accidental loss of the knob. 2018 KBF (Kayak Bass Fishing) Tournament National Champion Dwayne Taff said from Huffman, Texas, "KastKing has really set the bar with the MegaJaws. It is lightweight, low profile, and smooth casting with extreme power. 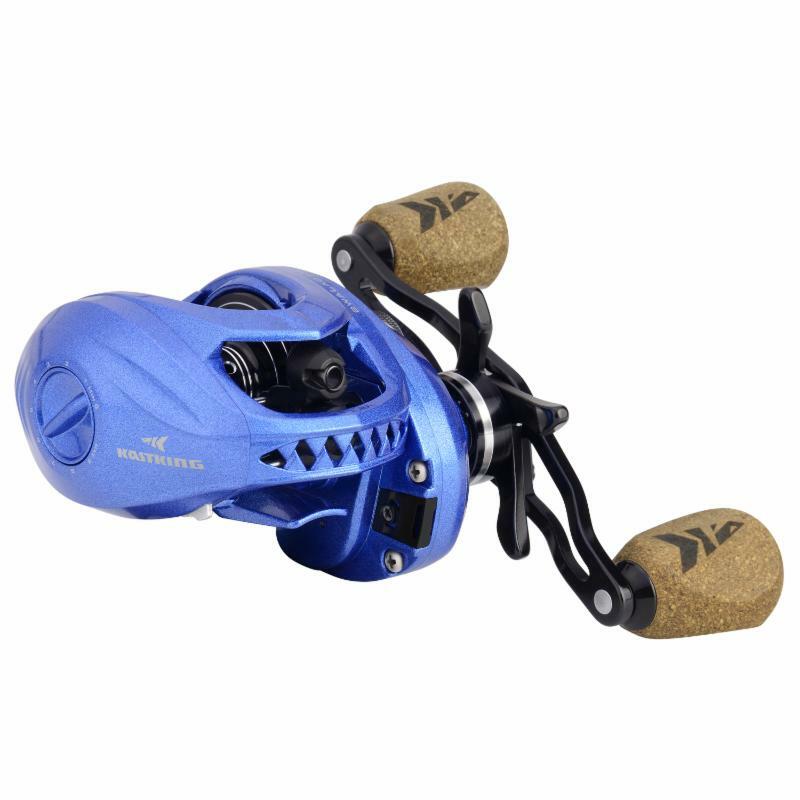 KastKing MegaJaws baitcasting reels are everything a tournament angler like myself needs to be successful on the water at an unbelievable price." MegaJaws shark tooth front hood, shark fin side covers, and metal components were included to represent the power and strength that sport fishing anglers desire today and to remind consumers of the sense of dominance and total confidence on the water. "We took a playful approach with the shark design and combined it with some of the best innovative engineering available in fishing reels today," says Tom Gahan, Chief Marketing Officer at KastKing. "KastKing was founded on keeping fishing fun and affordable innovation. KastKing MegaJaws supports that. MegaJaws will be a pleasure for those who are new to baitcasting reels as well as seasoned tournament competitors. "KastKing's Social Media Live Show host, AJ Gore, coined the term, 'The People's Champ' in reference to the KastKing Shaky III spinning reel. Given the durability, easy customer serviceability, and the forgiving nature of MegaJaws casting control systems, one would have to believe that MegaJaws will become the 'People's Champ' of our baitcast reel lineup." In addition to its shark-like details, MegaJaws has a unique performance feature named the KastKing LFTV (Low Friction Tapered Vortex) line guide. Along with an eight magnet, ten adjustment settings magnetic casting control system, it helps eliminate "bird nesting" or overruns that are often encountered with many baitcasting reels, especially by novice anglers. 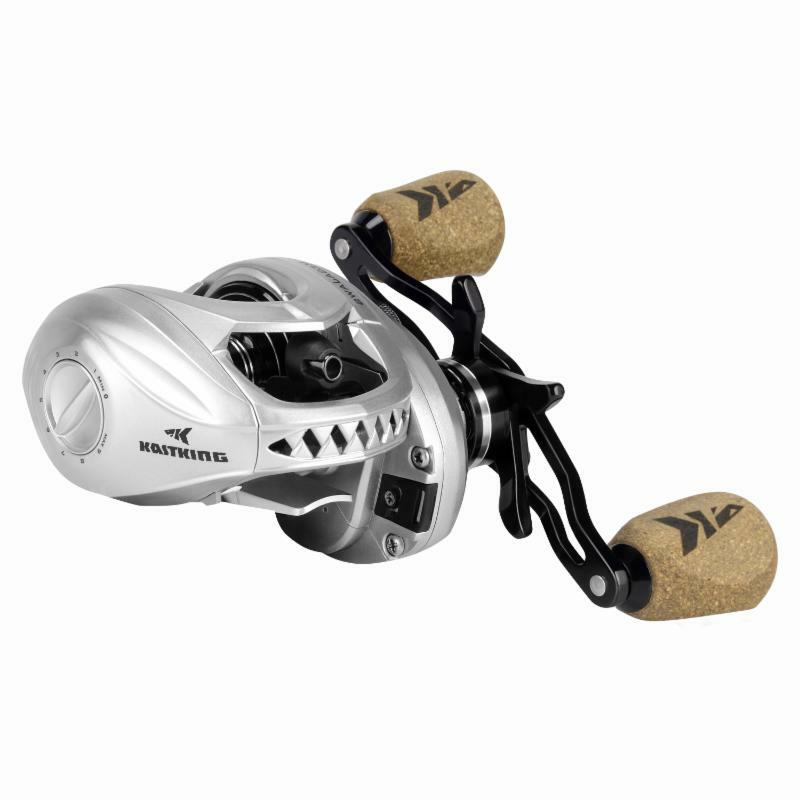 KastKing MegaJaws baitcasters are full featured and are suitable for tournament use. In addition to its double shielded stainless steel bearings throughout; manganese brass pinion and main gears and a nickel-coated brass worm drive gear were added to provide strength, durability and consistent performance for freshwater or saltwater fishing. 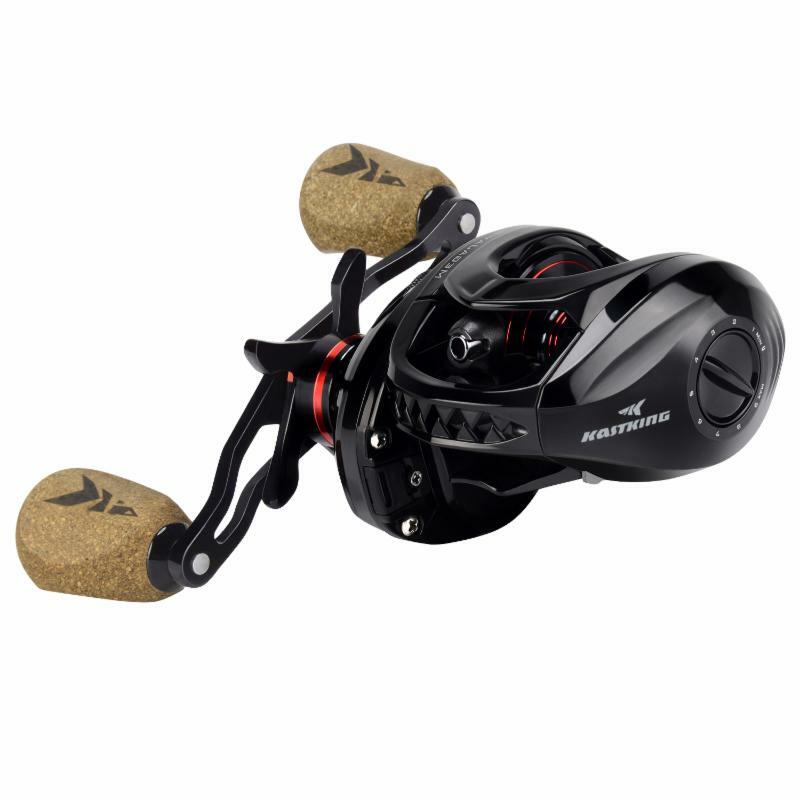 MegaJaws have an enhanced graphite body, a carbon fiber drag that uses multiple discs providing up to 17.6 lbs of drag power, stainless steel kick levers, CNC Aluminum spools with line capacities of 0.26mm/120m, 0.285mm/100m, 0.31mm/80m, and an aluminum handle with molded rubber cork knobs. 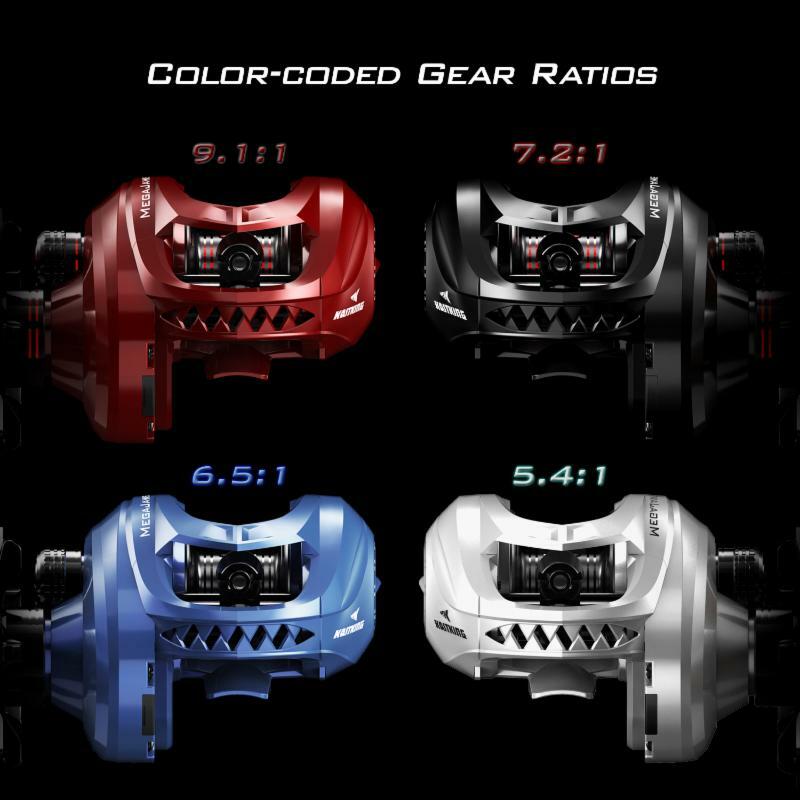 MegaJaws are offered in four shark inspired colors matched to gear ratios: Great White 5.4:1, Pelagic Blue 6.5:1, Blacktip 7.2:1, and Predator Red 9.1:1. Recently Bassmaster Elite Pro Bill Weidler said in a public social media post about MegaJaws, "...This reel is awesome. I've been testing it for a while. KastKing has put out yet another reel that I can't say enough about. Smooth as silk, powerful, everything you need in a tournament or fun fishing reel. This is a must have!" 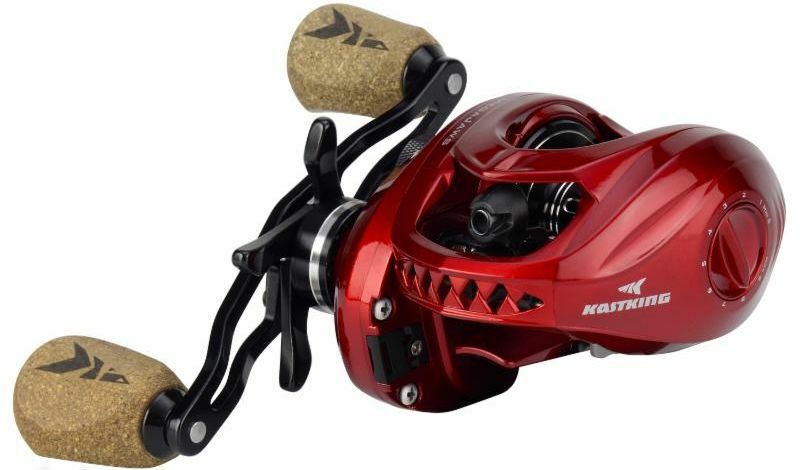 KastKing MegaJaws baitcasting fishing reels in gear ratios 5.4:1, 6.5:1, and 7.2:1 will be initially introduced through Amazon.com/kastking with an online discount price of $59.98 while the MegaJaws Predator Red 9.1:1 ratio will be priced at $69.98. MegJaws will be available through eBay, Walmart.com, and KastKing.com and other online retailers at a later date.